After collecting pallets for a few months, and letting them accumulate, he decided he had enough for the project at hand. His cats were going to be sad that their little play area was about to be turned into something amazing. He decided to put the shed on the side of his yard. There was a pretty good slope, so he had to dig deep down into the hard soil to make it an even surface for the footing. He ended up pulling out a ton of rocks too. He's not sure what to do with the rocks, but is thinking some sort of path might work out well. He started off with some concrete blocks that he found for free on Craigslist. That's quite the find and saved him a lot of cash too. 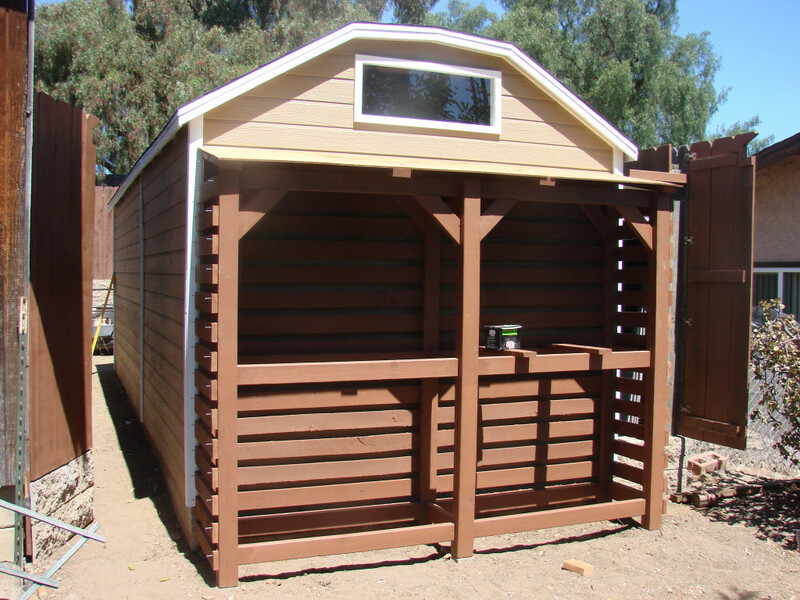 The shed he had in mind was going to be 6x8x16. It is pretty big and it took awhile to collect all of the concrete blocks he needed. He ended up creating the foundation by placing them in the dirt, then he mortared them together. 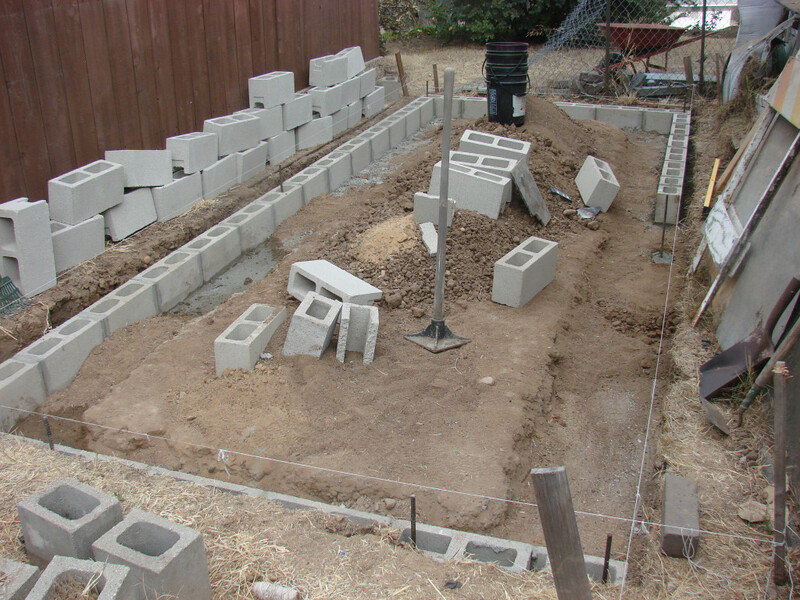 He put rebar into the concrete blocks in the corners and the center to create some stability for the soon to be shed. 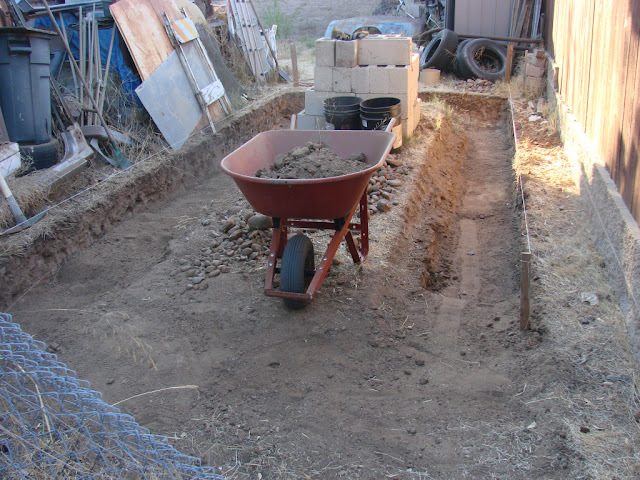 Once the concrete blocks were laid down for the foundation, it was time to start screwing and bolting the pallets together. He decided that the bottom piece of the pallet should be bolted into the blocks. Once the corners were tied together, it was a lot more stable than he expected. He threw a tarp overhead because he was making this in the summer and the heat was just too much. 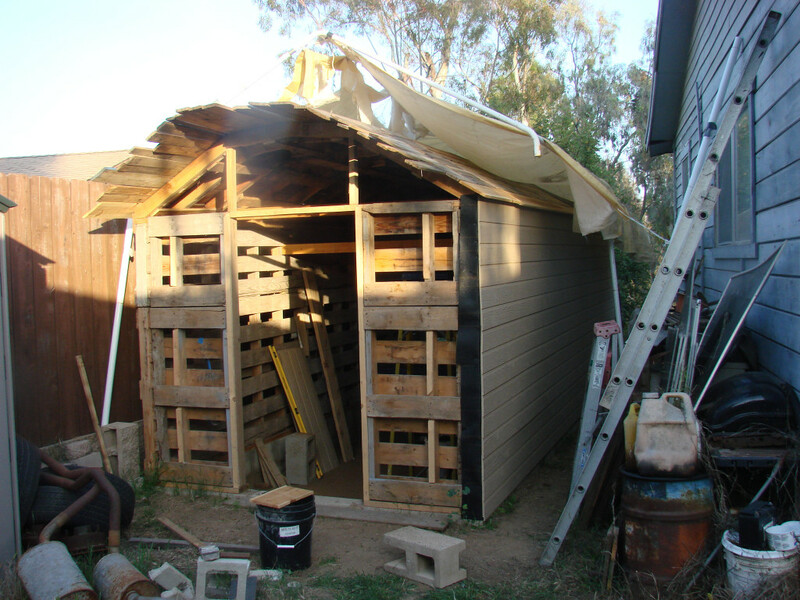 He didn't want the shed to be too tall, so he decided to cut the upper pallets in half. This prevented his neighbors from having to look at his shed, and it keeps everything within reach when it's stored in there. Now that the walls are bolted into place and the upper pallets are secure, this shed is very sturdy. He was going to make the floor so it would be level with the ground, but they don't get much rain so he decided to keep it a little lower giving him even more head clearance in the shed. 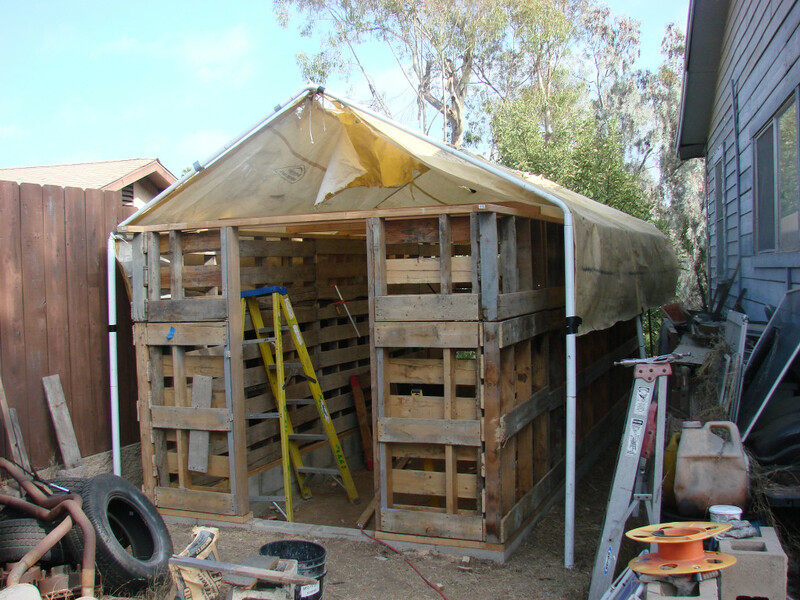 Because he did have a few pallets left over, he decided to use them for the roof too. He went for a barn style roof, mostly so the neighbors wouldn't have to see too much of the roof. Their house is lower on their property, so this was an ideal solution. 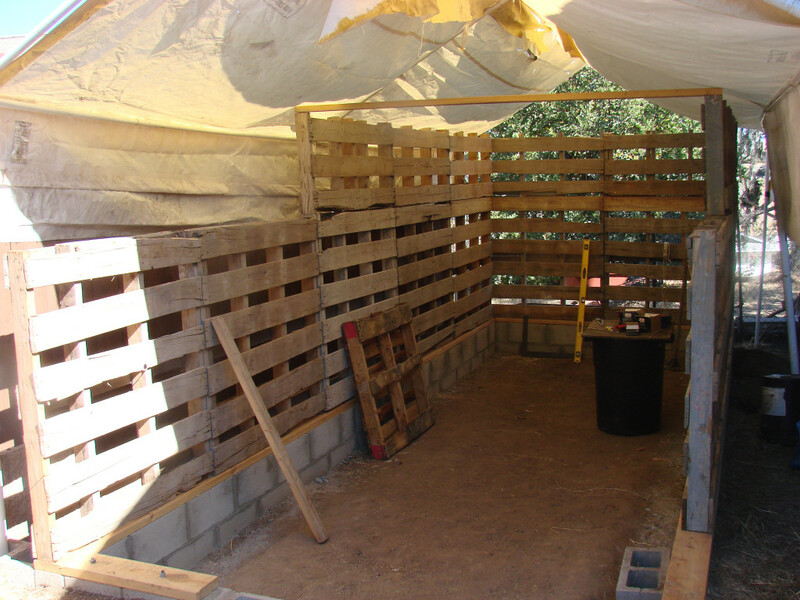 Once the structure for the roof was set, he used the remaining pallets and broke them apart to create smaller slats to fill in the structure. 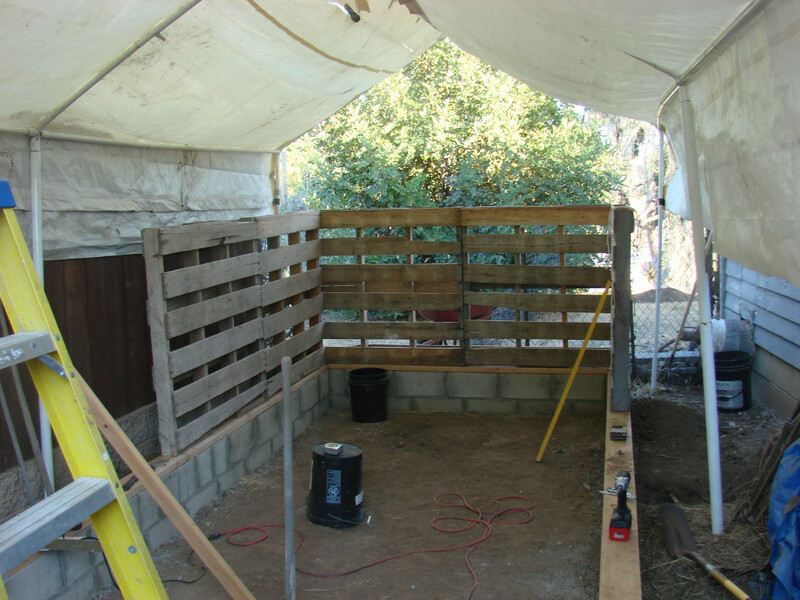 This shed is really starting to take shape. 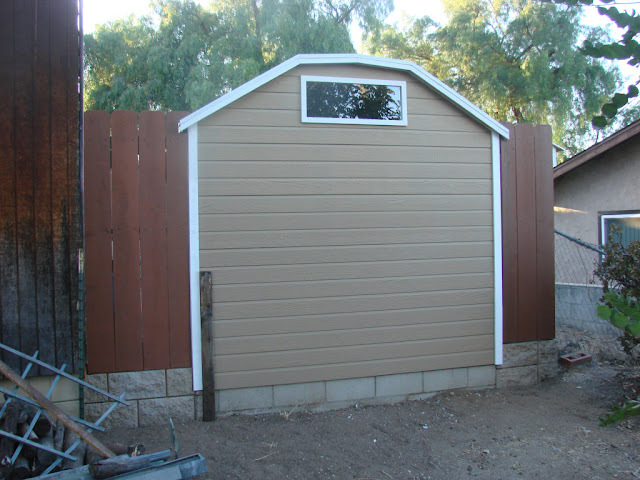 He found some inexpensive siding at Home Depot and the shed started to look like something he paid quite a bit of money for. 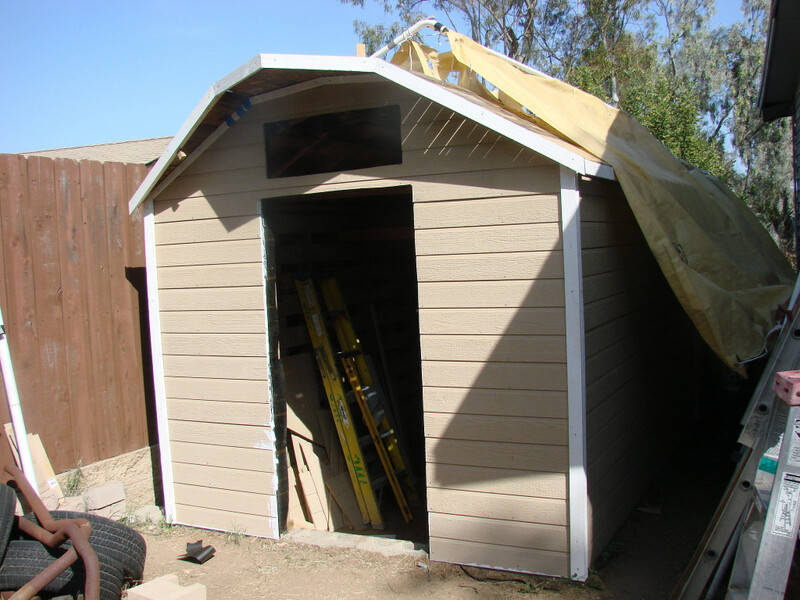 Luckily for him, all of his measurements were right on and the areas that required siding were flat, so this was a great way to add even more to this shed. 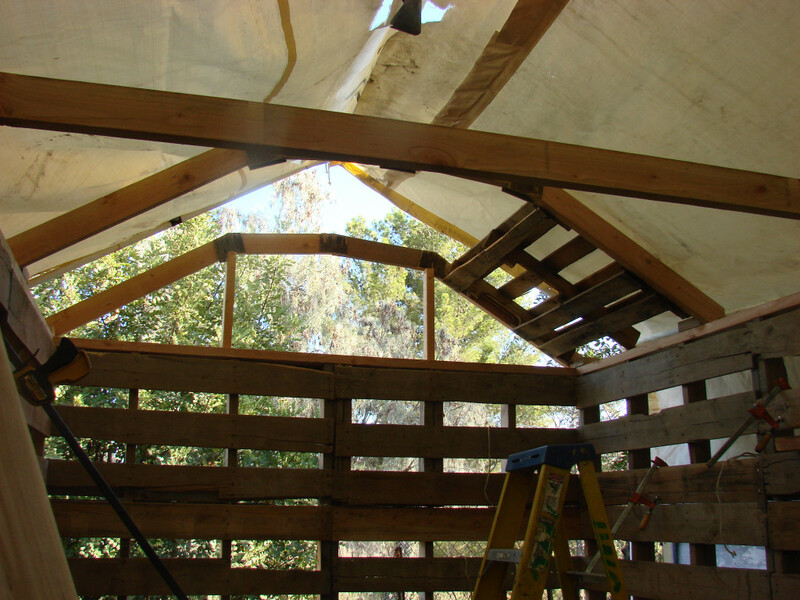 He found some glass on Craiglist, and decided to add windows to the shed to add some natural light. This is the view of the shed from the front yard. 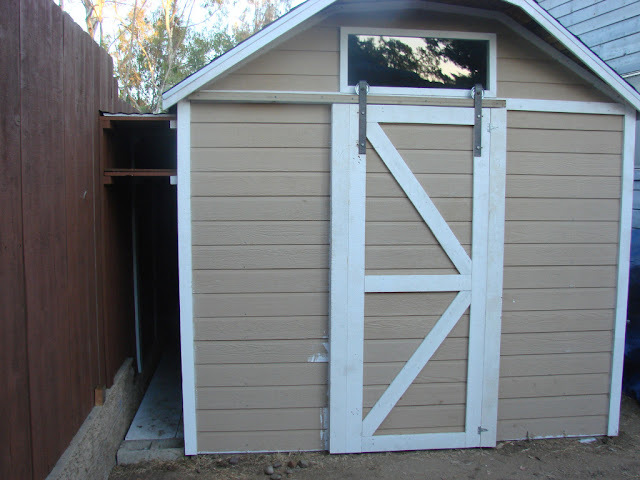 He tied the existing fence into the shed and the house to enclose the back yard fully. He has more plans for the front yard, so that 's why he decided to leave it bare for now. He decided to put an angled tin roof on one side to give him some storage. This way it would catch the water run off that they did receive on occasion and put it into a barrel. He ended up using a longer pallet he had for the door. He used a Kreg tool to tie the boards together on the door. On the front side of the shed, he decided to use this for wood storage. He loves having a firewood handy for a good fire, and wanted somewhere to store it where it wouldn't get wet and rot away before being used. 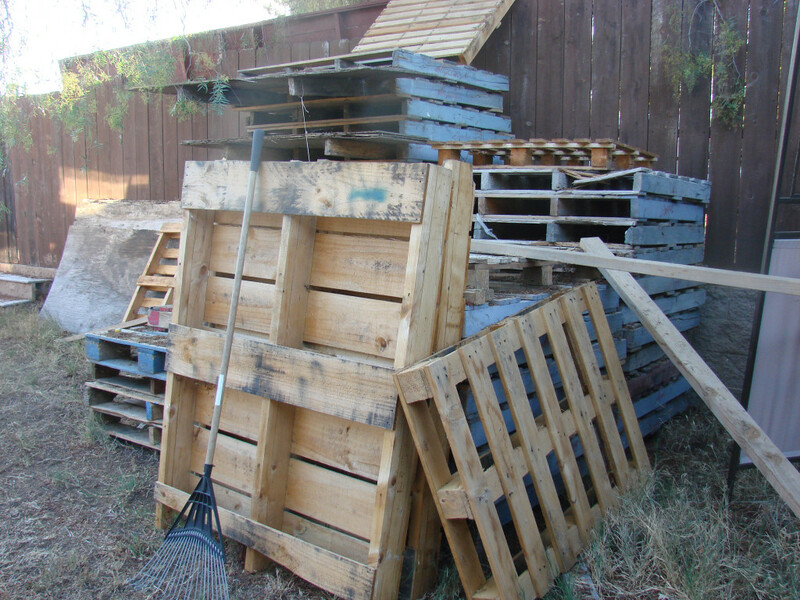 He found most of the wood on Craigslist, and used some pallets that he still had leftover. 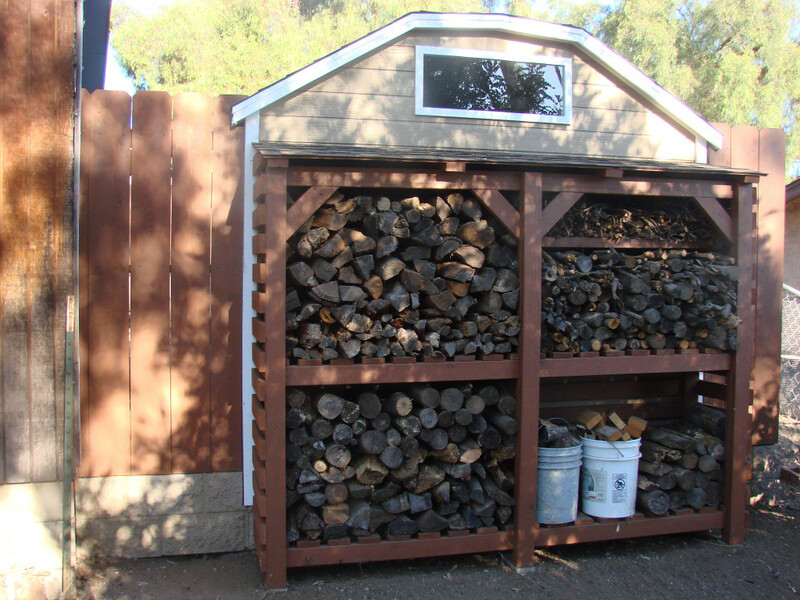 Now this shed is all stocked up and ready to go. He made shelves inside the shed using lumber he also found on Craigslist. In the end, he estimates that he spent about $500 total to make the is 20'x8' shed. That $500 went to things he couldn't find on Craigslist like siding, shingles, mortar, and random fasteners that were needed.